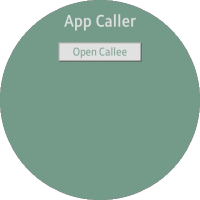 The App Caller and the App Callee sample applications demonstrate how you can use the application control to communicate with other applications. The App Caller and the App Callee applications only work properly with each other. 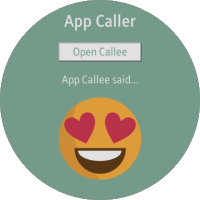 The App Caller application opens with the main screen which shows a button for launching the App Callee application. When the button is clicked, the App Callee application is launched, and it displays information about the requested App Control. The App Callee application also shows a list of icon images on the screen. When one of the icons from the list is clicked, it returns the data back to the App Caller application, and finally the App Caller application shows the selected icon image on the screen. The following figure illustrates the main screens of the App Caller and App Callee. Both the App Caller and the App Callee applications must be installed before you try to run either of them. appcaller/config.xml This file contains the application information for the platform to install and launch the application. appcaller/css/style.css This file contains CSS styling for the application UI. appcaller/image/ This directory contains the images used in the application. appcaller/index.html This is a starting file from which the application starts loading. It contains the layout of the application screen. appcaller/js/app.js This file contains the code for handling the main functionality of the application. The icon image set used in this application is designed and offered free by Emoji One. For more information on their license terms, see the Emoji One site. In App Callee, the <tizen:app-control/> element of the configuration file provides a service description for the application control. The operation name describes an action to be performed by the application. In App Caller, the ApplicationControl interface, which consists of an operation, URI, and MIME type, describes the request to be performed. When the system gets an application control request, it tries to find and launch the proper application to perform the requested application control. The following application control will launch the App Callee application whose operation is set as http://tizen.org/appcontrol/operation/appcall. The application control is passed to the launchAppConrol() method to launch an applicaiton. In App Callee, when the application is launched by Application Control, it grabs the request using the getRequestedAppControl() method. It displays the information about the operation by which the request was made and the id of the caller application. 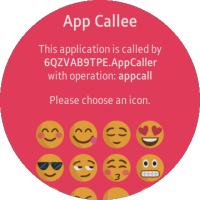 If the callee application was not launched by the App Caller application, it notifies the user that the App Callee app only works properly when launched by App Caller. The ApplicationControlData interface defines the key-value pair used to pass data between applications, and it is sent to the App Caller through the replyResult() method of the RequestedApplicationControl interface. The data must be an object array, and the value of the data must be a DOMString array. In App Caller, the appControlReplyCallback method is invoked when the application gets reply back from the callee application.